When everyone is mysterious, no one will be. 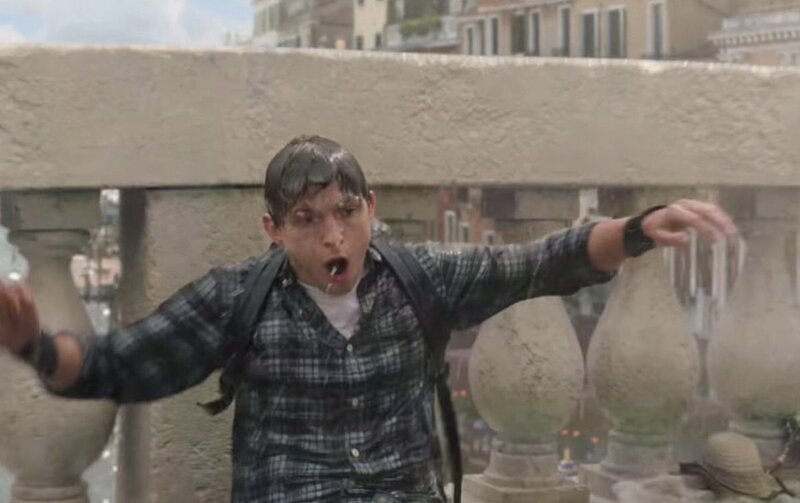 The first trailer for Spider-Man: Far From Home dropped today, giving fans their first look at Peter Parker’s Eurotrip and Jake Gyllenhaal’s spellbinding take on one of Spidey’s classic villains, Mysterio. 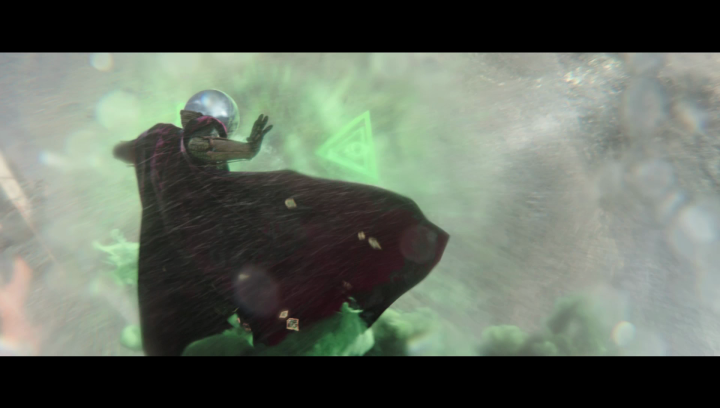 But what we saw of Mysterio in the trailer, in his first live-action portrayal, seemed far from the maniacal machinations we’ve come to expect from the self-aggrandized “Master of Illusion.” By the end of the reel, Peter’s classmates were in awe of Mysterio, calling him “Iron Man and Thor rolled into one” as they watched footage of him battling a giant water monster in Venice. Elsewhere in the trailer, Mysterio battles a rampaging giant that seems to be composed of rocks and sand. One that Nick Fury himself couldn’t take down. But what is Mysterio doing fighting these grotesques? Why is ol’ “Fishbowl Head,” special effects artist Quentin Beck, going toe-to-toe with (what appears to be) the Elementals? When Spider-Man tries to intervene, Mysterio warns “You don’t want any part of this” before shooting some nebulous green energy blasts from his gauntlets. Basically asserting that he, Mysterio, had the situation handled and there was no need for Spidey. Mysterio, as we know, is notorious for creating grand illusions. Giant tableaus that aren’t just intangible holograms, but a mix of faked imagery, robots, hypnosis, and whatever other tricks and tech he can utilize. Mysterio doesn’t just create intangible ghosts and other dangers that aren’t there. His deceptions – which have ranged from alien invasions to faked deaths to making himself appear as a giant – go beyond that of parlor tricks and, often, are capable of physically harming his foes. Like we see in the Far From Home trailer when, apparently, real lightning strikes threaten people. So what’s at the heart of Mysterio’s scheme here? Well, from the looks of things he’s pulling a Syndrome. Yes, that’s the lethal fanboy from The Incredibles who longed to be a superhero so badly that he killed off ex-heroes in an attempt to debut as the world’s lone savior – complete with a fake threat of his own design, the Omnidroid. Not only did Syndrome use the Omnidroid (which was made to learn and evolve so that it could defeat someone as powerful as Mr. Incredible) to kill off his competition, but his master plan involved unleashing the brutal bot on a city so that he could swoop in and defeat it easily (knowing how to best it because he designed it). And while appearances can be deceiving, especially when Mysterio’s involved, it sure seems like Quentin Beck, who in the comics is a disgruntled, failed actor with a knack for effects wizardry, is out to paint himself as a hero. If this story takes place post-Avengers: Endgame, then maybe Mysterio’s reacting to the world’s sudden lack of heroes and the population’s psychological need to feel safe and protected again. Parts of this plan are somewhat noble, but as we can see, Mysterio’s ruse comes at a severe cost since the water, rock, and fire monsters he’s presumably creating are next-level hazardous and cause real damage. In The Incredibles, Syndrome – real name Buddy Pine – also had another key element to his plan: to release all of his superhero tech to the public so that anyone, with deep enough pockets, could become “super.” It’s Buddy’s final flipping off of people born with powers. Still, we’re pretty sure Mysterio isn’t going “full Syndrome” here as we can’t imagine a world where he’d want to share his secrets with anyone. His goal seems to be remaining Hero Numero Uno in the public’s eye. And think of how easy it must be to deceive the ever-anxious populous? They’ve already experienced numerous alien invasions – from the Chitauri to Thanos to Ego oozing all over that small town – so it wouldn’t be hard to fake a quartet of extra-dimensional Elementals. Also, let’s not overlook the fact that the rock and water golems are super reminiscent of Spidey baddies Sandman and Hydro-Man. But that’s a topic for a different take. So why is Mysterio launching these superhero scenes in Europe? Is he specifically going where Spidey is? Is his need to rise up as a hero directly connected to Peter Parker? And what does this mean for the MCU’s possible stab at a Sinister Six storyline (with Vulture, Shocker, and the character who could become Scorpion already in place)?